Dr.J.Lakshmi Jeya Swaruoopa, the specialist in name numerology invokes almighty God's mysterious powers to bless you with outstanding success. She does it by the magic wand of names! She infuses the divine in your names, letters and numbers. It needs a certain Tapas & spiritual powers besides knowledge to invoke the divine blessing through names! 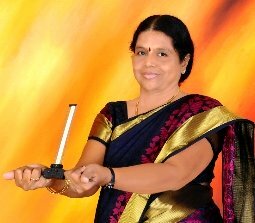 Dr.J.Lakshmi Jeya Swaruoopa never considers herself to be great. She always refers herself to being an instrument in the hands of great Lord Krishna and only God is solving the problems through her. Being disciple of the outstanding occult scientist Kannan M, She never thinks only the knowledge and mastery in sciences alone is enough for practicing the great findings. She attributes her success to the blessings of Krishna. Dr.J.Lakshmi Jeya Swaruoopa strongly believes one cannot practice occult sciences successfully without the almighty's blessings and spiritual power. Name Numerology and The power of Names! Alongside the great Kannan M, Dr.J.Lakshmi Jeya Swaruoopa studied Bhagavat gita Lord Krishna's words of wisdom to Arjuna and Vishnu Sahasra nama. She researched to invoke Lord Krishna's blessings through Sahasra nama and power of names. Dr.J. Lakshmi Jeya Swaruoopa's great grandfather Subbusivam is a descendant of great devotee of Appaya dikshidhar. She recites 18th chapter of Bhagavat gita and Vishnu Sahasranama everyday. Both Mr.Kannan M and Dr.J.Lakshmi Jeya Swaruoopa hail from the most divine and blessed families. It is a tool in the hands of a spiritual person to invoke God! Besides numerology, astrology, horary astrology the Disciple of great Kannan M has mastered holy scriptures right from her childhood. She is one among the elite group of spiritualists to visit 106 divya desas and has very deep knowledge on vaishnavism. Alongside the legend Kannan M with her Spiritual power and abundant knowledge in Numerology, astrology, horary astrology and Bioenergetics she has positively transformed so many clients lives with Lucky Name Numerology! Mr.Kannan M invoked almighty God's mysterious powers for giving outstanding success. He infused the divine power of names, letters and numbers for success. He developed his system of name numerology to make people successful when otherwise their lives would have been miserable indeed! People from all over the world benefit from his talents & expertise in this field. Without any pursuit of any material acquisitions, Kannan M used to repeat these sacred holy scriptures in which each line is a sacred Mantra, Mantra is a tool in Name Numerology to invoke God's blessings. Research in Power of Vibrations! Besides researching names, numbers and vibrations. He got his degree in chemistry from highly regarded and famous St. Joseph's college, Trichy and His degree in Chemical engg. From the reputed and the most commendable IIT, Madras. He used his scientific and engineering knowledge to measure and study the vibrations in alphabets and numbers. He mastered use of high tech scientific instruments like the lecher antenna to measure the vibes! The founder is also qualified Bioenergitician from France. He used his bioenergitics to cure diseases of incurable nature. 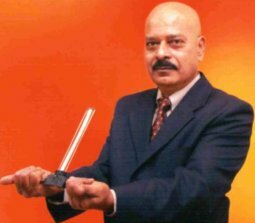 He was practicing for the past 10 years as the no.1 Bioenergitician in India. Kannan M hails from a highly spiritual parentage. His great grandfather is the famous Vaidhyanadha Dikshidhar who wrote the best commentary for Lalitha Sahasranama given to us in the 30th chapter of brahmanda purana. It is a priceless contribution and heritage, considered most authentic by Sringeri Mutt in India.